Adhering to the theme, “Jealousy in Opera,” 18 young singers from around the world competed for prestige and cash prizes before a sold-out audience of opera devotees and music lovers, artist’s managers and a renowned jury at the Altamura/Caruso International Voice Competition in Round Top. On Sunday afternoon, baritone Lawrence Harris won the coveted, $6,500 first-place prize after his arias from Puccini’s Tosca held the audience spellbound. In addition, he was awarded the esteemed Audience Prize. But Mr. Harris’ résumé reads a little differently from most. A former offensive linebacker for the Houston Oilers, the Texas native, who is part Choctaw Indian, had always harbored a quiet desire to sing. When he finally hung up his cleats, he wasted no time trading one set of bright lights for another. Armed with determination and two bachelor’s degrees, he headed for New York where he enrolled in the Manhattan School of Music. Moreover, he was able to pursue specialized training from independent teachers and coaches with generous financial assistance from the Metropolitan Opera National Council. The hard work and dedication paid off: He was recently signed by International Music Talents, an artists’ management firm in Paris. Winning second and third place, respectively, were baritone Jordan Shanahan of Honolulu and bass-baritone Todd Donovan of St. Petersburg, Florida. 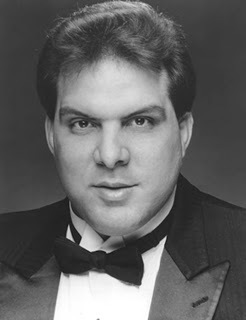 Honorable Mention was given to tenor Jeffrey Halili of Philadelphia, who, in addition to singing his own roles, stepped in on a moment’s notice to perform the role of an indisposed guest artist. Each of the remaining contestants received a $500 honorarium. Donald C. Drake, a former staff writer at the Philadelphia Inquirer, whose series was nominated three times for the Pulitzer Prize, was honored with a special award for his principled and humanitarian works. Camille Coppola, the highly-regarded founder of the New Rochelle (NY) Opera, served as stage director for the “Jealousy in Opera” scenes. Anton Coppola (no relation), director of Tampa Opera and renowned composer of opera and film, conducted and served as Artistic Director. Maestro Coppola, who is the uncle of famed Academy-Award winning film directors Francis Ford Coppola and Sophia Coppola, composed the film scores for the Godfather III and Dracula, among others. With help, talent and ambition, Lawrence Harris has come a long way from the locker room. Reflecting on the circuitous route that brought him to this place and time, he told a prophetic tale. When he first entered the NFL, rookies were often made to sing in the mess hall at the whim of a superior. Rock songs, college fight songs or nursery rhymes were offered up. But when it came Mr. Harris’ turn, he broke out in an Italian aria, leaving the gape-mouthed players speechless. Fast-forward to New York, August 24, 2008, where, far from the NFL, Lawrence Harris finally earned that respect from his musical colleagues – and of everyone else present as well.